Many people don’t understand the value of a good credit score. It’s more than the prestige of having a high number. It’s your ability to get a car loan, an established credit card and borrow when you’re ready to buy a home. As a consumer and an investor, you want to have access to credit as you build and grow your portfolio. Sometimes borrowing makes sense because you can accomplish more objectives faster. If you didn’t borrow, and you saved to buy a house, you could do it, but it would take you a long time. Debt can help you achieve those goals when you use it wisely to build a good credit score. A lot of credit card companies include your credit score on your statement. This is helpful, but by no means should be the most meaningful place you’re getting information. Ultimately, you want to obtain a copy of your credit score as tracked by the three major credit bureaus – Equifax, Experian and Transunion. You can get this at www.creditkarma.com. You’ll also want to do a yearly check of your credit report for possible identity theft and errors. 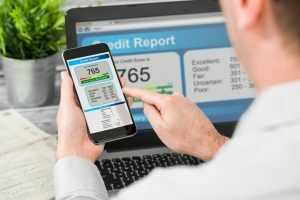 You can review yours at www.annualcreditreport.com. If you find an error, let the credit bureau know. You have an opportunity to fix it, but you need to hop on that right away. You want to make payments consistently and on time. Late payments are bad, especially since this is the single highest percentage factor. If you have a lot of different credit cards and small balances on them, you could borrow a lot. That’s called your debt utilization ratio. This is why it’s okay to have a high number of outstanding cards as long you’re monitoring your debt utilization ratio. The most ideal scenario is that you could pay all your debt off in one month, which makes you very attractive to credit card companies. This includes bankruptcies, other debts, loans written off, etc. – you really don’t want to have any of these things. Also, the length of your credit history is important. Can you handle basic payments for utilities or the amount your debt is now? Is taking on new credit going to upset the balance of being able to pay your bills going forward? Opening a bunch of new lines of credit at once will have a negative effect. Is it really that bad to cancel a credit card? Yes, it could lower your credit score. You want to show a long history of paying your bills on time. How often should I use my credit card? Periodically. This keeps them active; otherwise, the company may cancel it. Isn’t a debit card better? Using a credit card helps establish your valuable credit history. Young people, in particular, should want to start building credit, so this maybe something to talk about with your college student/recent grad. Establishing credit today can help you save big money in future years with better interest rates. For example, if you’re approved for 4.25% versus 4%, that extra quarter of a percent will cost you $15,527 more on a $300,000 30-year mortgage. If you’re responsible with credit, it can work for you.